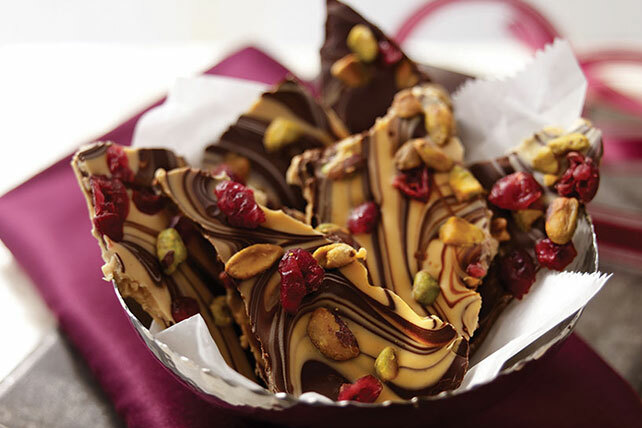 If you can melt chocolate, you can make this scrumptious Chocolate-Peanut Butter Swirled Bark studded with cranberries and pistachios. Mix white chocolate and peanut butter until blended. Drop spoonfuls of white chocolate mixture and semi-sweet chocolate alternately onto waxed paper-covered baking sheet; swirl gently with knife. Sprinkle with cranberries and nuts. Refrigerate 1 hour or until firm. Break into pieces to serve. Balance your food choices throughout the day so you can enjoy a serving of this easy-to-make candy. Prepare using PLANTERS Peanuts or Slivered Almonds.